Ingrid's papa went to town to buy a new goat. Her mama used goat's milk to make cheese and butter. 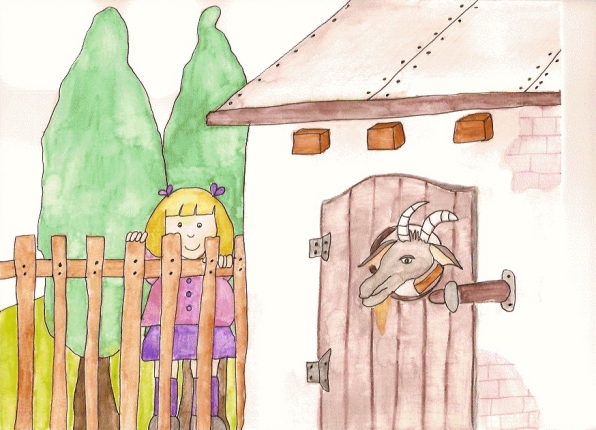 When Papa came home, he put the goat in a shed. The goat heard Ingrid's voice and stuck his head out through a hole in the door. His horns barely fit through. “That's a funny name. I don't like it. I think I'll call you Don Quixote. He had beard and a long face like you. He didn't have horns though.” Ingrid giggled. The goat nodded its head up and down. “Very well, Don Quixote. You are to give mama lots of milk tonight. I want some cheese and butter. Nod your head if you understand me,” Ingrid said. A few minutes later Mama came outside. She opened the gate. “You stay out here,” Mama warned Ingrid. Ingrid stared at her mama. “Nod your head if you understand me, Ingrid,” Mama said. “Mehhhhh. Mehhhhh,” went the goat. “I should have listened. That's what you wanted to be called earlier. Mehhhhh, mehhhhh, it is then.” Ingrid ran back into the house to watch her mama make cheese. She was glad to have a new goat.